When choosing the best multi tool there are a lot of factors to consider, whether it be size, strength, tools included, modding ability, and even price. There are a lot of great brands out there, with the leaders being Leatherman and Victorinox. The other smaller brands do as good a job as the big names, so that shouldn’t be a big deciding factor for most users. Also important to remember is that these are not replacement tools for the real thing. Although multi tools can be used in a pinch when needed, in almost all cases if the full sized tool is available it will always function better. Using a multi tool allows for professionals and civilians to have a good portion of their most important tools right at their belt, in the glove box, in the kitchen drawer etc. With a multi tool users are prepared for anything that comes there way, and are never in a bad situation. Multi tool are used by professionals such as mechanics, police officers, carpenters, and even the military. There are some on the list that even allow you to change some of the tools on the unit to more preferable tools, for greater long term use. One of the items on the list is even small enough to fit on a keychain. Multi tools can carry as many as 30+ individual tools, with many of them being of high quality. How useful they will be will be up to what they are used for, as many of the tools on a multi tool will probably never see sunlight. Even though it is still a great asset to have for hunting as a companion for a pocket knife, survival knife, or camping knife. The Leatherman Charge ALX 6061-T6 Multi Tool is a high priced product meant for intermediate users and up, and comes with a high quality black oxide molle sheath. Other accessories include a Leatherman 931009 bit driver extension, all in an 8.5 ounce package. Closed the tool 4 inches, open it is about 6.3 inches. Included tools are needle nose pliers, regular pliers, wire cutters, hard-wire cutters, crimpers, 154CM knife, 420HC serrated knife, cutting hook, saw, bottle opener, can opener, and wire stripper. There is a fixed lanyard ring for great portability, and it is of good quality. Blades are all locking, and are improved from the previous generation and built with quality in mind. 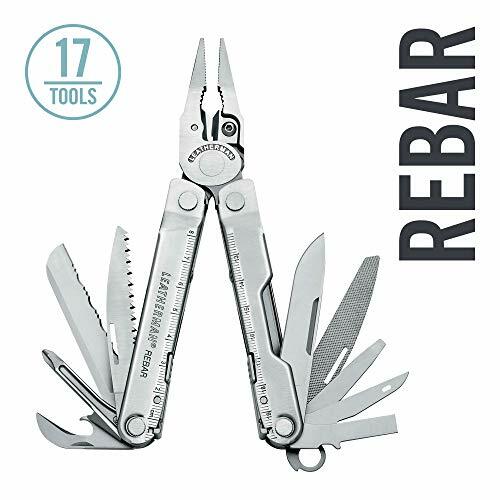 With 100% stainless steel construction this is a great quality multi-tool for the avid outdoorsman. This is meant for right one handed operation, so left hand users may feel awkward. Blades are acceptably sharp and hold up well over repeated use, with a comfortable enough handle to not be a hindrance to the user. Sharpening the blades can be a bit of a chore, but with the right equipment most users should be okay for a couple of years. Some functions of the multi tool work better than their individual equipment, providing even better leverage with the Leatherman Charge ALX 6061-T6 Multi Tool than if they were used by themselves. This multi tool is one of the best reviewed and beloved products on the market. This is a low priced multi tool that also includes a blasting cap crimper, making it one of the more unique items on the list. It has a non-reflective back finish with an overall weight of 9 ounces and length of 6.61 inches when open. It is another right one hand operation multi tool, which gives smooth operation with the flick of the wrist. Closed length of the multi tool is only 5.04 inches, making it easy to hide in many situations. A limited lifetime warranty is included with purchase, which for the most part is competent enough for the average user. Components on the Gerber 07400 DET Multi-Plier 600 include needle nose pliers with blasting cap, wire cutters, wire crimpers, C4 punch, a fine edge knife, saw with universal coupler, cross point screwdriver, large flat blade screwdriver, can opener and a file. A lanyard ring helps to make this product extremely portable and easy to carry around. The tools are all of high quality and well-reviewed, while the knives if taken care of can hold a great edge for years. It is built to take a beating and does a good job of performing well in all weather conditions. Professionals swear by this model and even older models as the standard that Gerber set with multi tools. This set performs well for beginners and up, and is extendable with extra add-ons and accessories. With a focus on safety with all locking blades, the Leatherman New Wave Multi-Tool even throws in a high quality leather sheath into the package. Users are conveniently given 1 hand access to 4 outside tools, with the entire construction being durable and made of 100% stainless steel. The entire multi tool is only 8.5 ounces, measures 6.3 inches open and 4 inches closed. Even though there is only a limited warranty on this product, it is an incredible 25 year limited warranty that will without a doubt make the purchase worthwhile. Components included in this multi tool are needle nose pliers, regular pliers, wire cutters, hard-wire cutters, clip-point knife, serrated knife, saw, scissors, wood/metal file, diamond-coated file ,large bit driver, small bit driver, large screwdriver, an 8 inch ruler, bottle/can opener, wire stripper, and two double ended bits. The entire product can be safely and comfortably carried with the included lanyard attachment, or just carried in the included sheath. For users interested there is a slot on the end for a pocket clip, making the unit even more portable and convenient. Although extremely portable it is admittedly more bulky than most multi tools, and may be a bit much for those expecting a tool half the size. The scissors on this model are a not as strong as other multi tools, and there will a noticeable difference in power when doing some tough cutting. 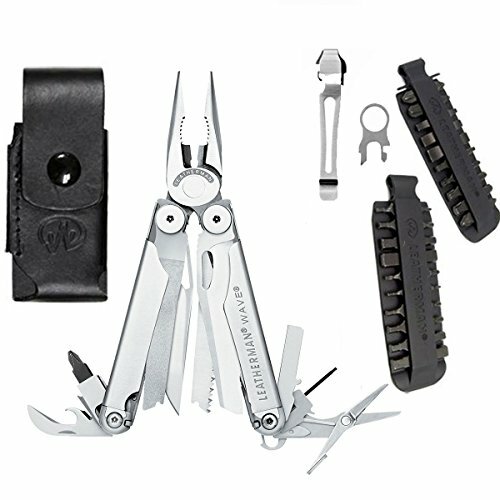 The Leatherman New Wave Multi-Tool is still respectable and a good buy for anyone looking for a do it all multi tool. 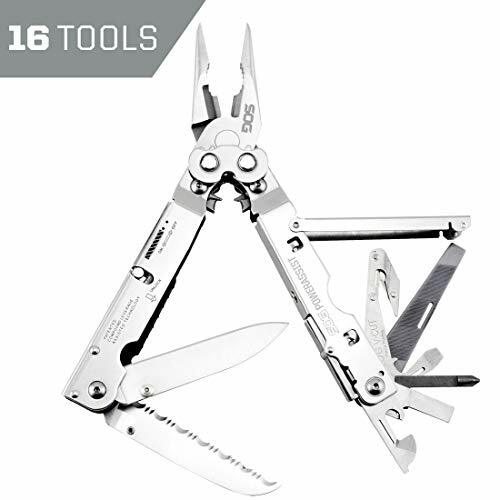 This is one of the lower priced units on the list, and is a smaller 6.7 ounce stainless steel multi tool that should give any user exactly what they need at a bargain price. The Leatherman Rebar Multi Tool was modeled after the fabled Leatherman’s Super Tool® 300 and Micra® but with a more portable size in mind, without sacrificing durability. Adding to the portability is a well-placed lanyard hole that should suit most users looking to get the most space out of their device. Tools included are an electrical crimper, 420HC knife, 420HC serrated knife, wood/metal file saw, small and large screwdrivers, Philips screwdriver, 8 inch ruler, bottle opener, can opener, and wire stripper. The wire and hard wire cutters are replaceable, and adds a different dimension to the entire set if the user gets creative with the possibilities. Even with the included black sheath the entire tool fits comfortably in any pocket, feeling like it is just a set of keys and nothing more. All the included tools lock into place, with the ability to lock multiple tools into place at the same time. This has one of the best handles on the list, and considered the size, still manages to be ergonomic while getting even the heaviest of jobs out of the way. If looking for a small do it all multi tool that won’t get in the way, then this is a good choice. 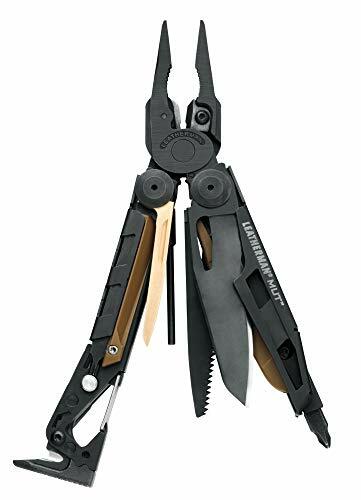 This updated Leatherman has 19 tools in the set with outside access to the tools for one handed opening. Blades and tools are all locking and enclosed in a very high class stainless steel handle. This is a low priced multi tool that delivers the goods of the higher priced items, with similar quality. Tools on the unit are needle nose pliers, regular pliers, 154CM replaceable wire cutters, 154CM replaceable hard-wire cutters, stranded-wire cutters, electrical crimper, wire stripper, 420HC knife, 420HC serrated knife, saw, Awl w/ threaded loop, 9 inch ruler, can opener, bottle opener, wood/metal file, Philips screwdriver, large screwdriver, medium screwdriver, and a small screwdriver. 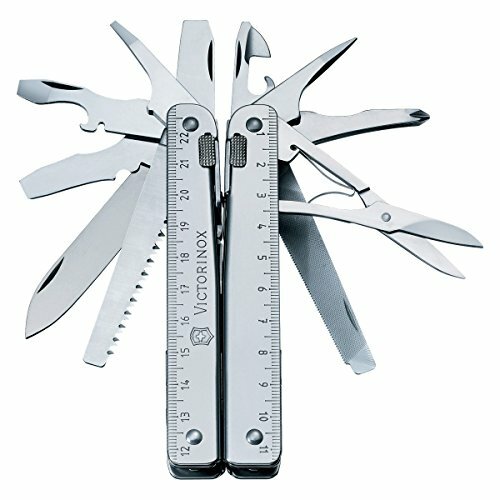 All of the tools are of great quality and follow the brand line of Leatherman fairly well. Closed the set is only 4.5 inches, with everything only weighing a good 9.6 ounces. The warranty from Leatherman is pretty good, although it is not a full lifetime warranty. This is also one of the few items to come with a leather sheath, and not a cheap plastic or nylon sheath. As one of the heavier multi tools on the list, it’s still one of the better ones for what the use gets. Does not contain scissors, and there is no add on for it, so may deter some users. Many have called it an improvement in the series, and this specific model is well reviewed across many websites. With replaceable cutters and thicker pliers, one of the better and more durable items on the list. Unique in not only the way it operates, but also the way it looks when being used. The Victorinox Swiss Army SwissTool is an imported multi tool constructed of rugged stainless steel. With the addition of onestep access, users can open the tool from outside of the handle. Only measuring 4 ½ inches long and weighing 7.2 ounces, this multi tool can be locked with a slide release, making it that much more portable. Components included are pliers, 2mm screwdrivers, 3mm screwdriver, wire cutter, 5mm screwdriver, bottle opener, 7.5mm screwdriver, large blade, scissors, belt cutter, wood saw, reamer/punch, Philips screwdriver, chisel/scraper, strong crate opener, wire bender, wire stripper, wire scraper, wire crimper, can opener, 9 inch ruler, 230mm ruler, and hard wire cutter. Included is a lanyard hole and a separate nylon belt pouch for carrying. Comes with a great lifetime warranty, and due to the stainless steel construction, very few will need to be returned. May take a while for the blades to loosen up, and one handed opening is more of a chore in the beginning until the multi tool is broken in. The included nylon case is not of the highest quality, but a different case can be used for the set that accommodates what the user needs. Most of the tools in this set are quite easy to get too and don’t require that extra step that most multi tools do. Does fairly well in comparison tests to other brand name tools, and on individual tools usually does very well. Even with the break in period, this is still a great buy for any user looking for something to last a lifetime. 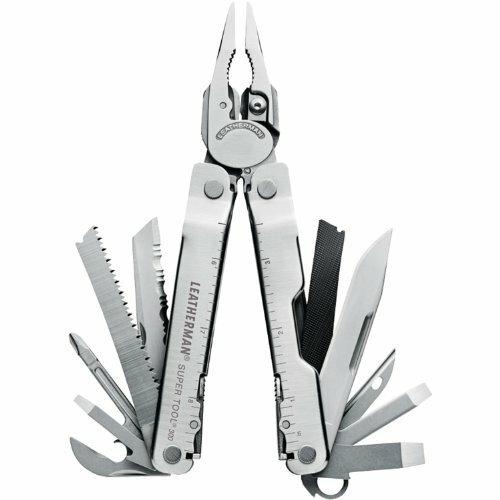 Leatherman makes another appearance on the list with the Leatherman MUT Multi-Tool, one of the higher priced items on the list and considered to be high end. Used by military and civilians alike, several areas on the tool are threaded for cleaning rods and brushes, while most of the commonly used parts can be replaced with ease. Screwdriver bits are sized for standard adjustments whether it be through civilian use or military. Using a torx #8 users can take advantage of the simple system put into place by Leatherman and effortlessly replace most of the commonly used parts. Tools included are needle nose pliers, regular pliers, 154CM replaceable wire cutters, 154CM replaceable hard-wire cutters, stranded-wire cutters, electrical crimper, 420HC combo knife, saw, replaceable cutting hook, hammer, bolt override tool, replaceable bronze carbon scraper, #8-32 cleaning rod/brush adapter, replaceable firearm disassembly punch, carabiner/bottle opener, large bit driver. 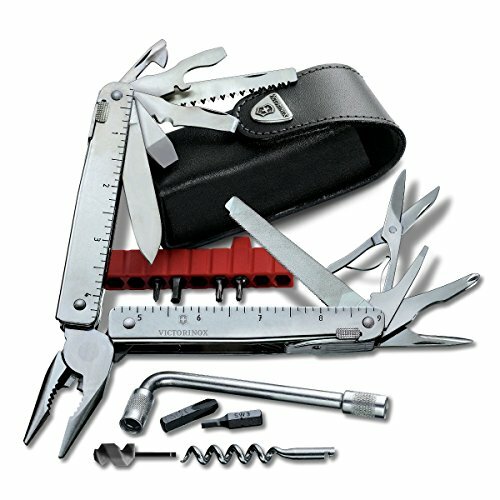 There are some unique tools in this set when compared to others, which may be of heavy use or not use at all to some users. This is one of the larger multi tools on the list at a closed length of 5 inches, and a weight of 11.2 ounces. A good quality MOLLE sheath and scope adjustment wrench comes with the set for modifying it to the user’s needs. The stainless steel used in the construction of the Leatherman MUT Multi-Tool is corrosion resistant and holds it edge longer than comparable steel in the same category. While being more durable than other sets it retains some of the lighter properties of other sets, so although not the heaviest on the list, the little bit of weight that it has lends itself to some of the strength properties of this multi tool. Another high priced multi tool on this list is the Victorinox Swiss Army SwissTool Swiss Army Knife, imported as a stainless steel multi tool with over 37 functions to its name. A lifetime warranty is included in this durable set that only weighs 10 ounces and measure 4.5 inches long closed, making it easy to carry around in a pocket. Tools in the set are pliers, wire crimping tools, wire bender, reamer, 7.5mm screwdriver, 9 inch ruler, wire scraper, 2mm screwdriver, scissors, metal file, crate opener, hard wire cutter, corkscrew, large blade, 5mm screwdriver, can opener, wire cutter, wood saw, cap lifter, 230mm ruler, 3mm screwdriver, metal saw, Philips screwdriver, chisel/scraper, wire stripper, and mini screwdriver. The included pouch will fit the bit wrench, cases, and corkscrew without a problem. The holster is made to carry the multi tool and an assortment of extras without a problem, and includes a separate space for them. The Victorinox Swiss Army SwissTool Swiss Army Knife is a very well built multi tool that will more than outlive its intended purpose because of its craftsmanship. One of the better safety mechanisms is built into this multi tool and will come in handy when it is used under heavy pressure. With each tool having its own spring, opening one without affecting the others is as easy as a flick of the wrist. As one of the lower priced items on the list, the Gerber 22-41545 Black Diesel Multi-Plier features one handed opening and fully lockable blades. With fewer features than some of the multi tools on the list this is suitable for beginners, and the safety features are very much ideal. The entire unit has a closed length of 4.92 inches and weighs a total of 8.6 ounces, coming in as one of the lighter multi tools on the list. Tools onboard are needle nose pliers, wire cutters, partially-serrated knife blade, cross point screwdriver, small, medium, and large flat blade screwdrivers, can opener, bottle opener, file, saw, and scissors. The lifetime limited warranty is adequate and well supported by Gerber for the duration of the product. 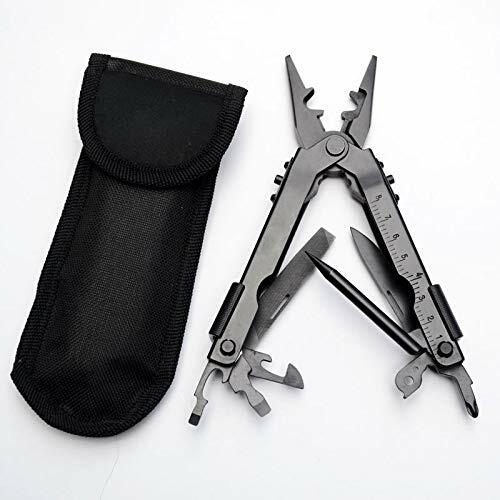 The tools on the unit are more suited for everyday tasks, and a lot of the other tools found on other multi tools on this list are not included, and as such this is meant for someone looking for a simpler set. Being black coated means this rusts less than the stainless steel versions, but there is also a harmless black residue that comes off during the initial break in period. As one of the lighter tools on the list it doesn’t suffer from the common durability problems, and should be sufficient for most of the tasks thrown at it. With consideration for the tools available with this set, it is one of the more user friendly sets on the list. One of the more unique items on the list is this multi tool from SOG that has the PowerAssist feature for assisted steel blades, offering more power, comfort and reliability on harder tasks. Tools are made of 420 steel with a nice satin finish, and features over 16 individual tools. Tools on the unit are a full serrated blade, three sided file, blasting cap crimper, bolt grip channel, bottle opener, can opener, hard wire cutter, large flat screwdriver, medium flat screwdriver, needle nose pliers, Philips screwdriver, ruler, small flat screwdriver, straight edge blade, v-cutter, and wire crimper. All of this is portable and lightweight while coming bundled with a nylon sheath. Where the SOG Specialty Knives & Tools S66N-CP PowerAssist Multi-Tool shines is through its compound leverage technology. By employing multiple pivot points, users get twice the power and makes all tools as smooth as butter during use. Portability is enhanced with a lanyard hole and secure clip attachment with hook and loop closure. A limited lifetime warranty from SOG does a good job of protecting users from future failures. Closed length of the unit is 4.6 inches with a total weight of only 9.6 ounces. Reassembling and modifying certain tools on this multi tool is one of the easier tasks, and after some light reading will become second nature. As one of the lower priced items on the list, this is one of the best and lightest multi tools users can buy. 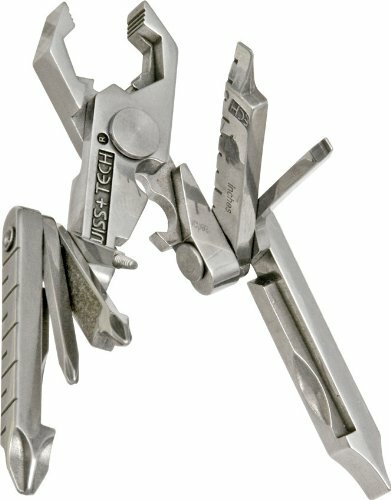 The Swiss+Tech ST53100 Micro-Max 19-in-1 Key Ring is the cheapest multi tool on the list by far, and also the most compact. It is made to fit on a key ring, and despite its small size, fits a lot of tools into its body without being overcrowded. Connection to current key rings is made painless due to the patented quick release integrated locking system, allowing users to attach it to any key ring without need for an additional ring or belt holster. Tools on the ring include six screwdrivers, two hex wrenches, pliers, wire cutters, wire strippers, wire crimper, hand drill, file, bottle opener, two rulers, and two ruler extensions. Item weight is only .3 ounces, making it the lightest on the list by a landslide. This one has been around for a while, and is still one of the more sought after multi tools on the list. The small size does have its downsides, mainly lack of power, leverage, and in some cases angle. As the smallest and lightest on the list, this is also the weakest. It is meant only for small jobs, and will cause cramps in hands if used a bit too much. The locking mechanism is also not foolproof, and as a result the multi tool may end up detaching itself from the user’s key ring if handled harshly. Wear over the years may make it even more susceptible to loosening, but this is still a good buy for the price. The pros are right there on the surface with being able to carry half a toolbox in a pocket, or on a keychain in the case of one of the multi tools on the list. This cuts down on space needed, and in an emergency situation the solution can easily be found in a user’s pocket. They are also beneficial for quick jobs on the spot that don’t require lugging around an entire toolset. In situations where a user has spent a fortune on a set of tools and does not want to lend out one of them to a comrade, a viable solution is lending out the multi tool in its place and not worrying about losing a single tool out of a set worth hundreds. As a starter set of tools for someone starting out in their craft, a multi tool is a wonderful and safe bet gift. The bad side to having everything in one tool is that most people don’t need even half the tools in the set. With limited ability to modify tools on a set users will always be stuck with tools that they don’t need and will never use. A lot of these tools that will never be used could be sacrificed and make the product lighter, the remaining tools stronger and more durable, and even lower the cost of the item by a lot. Even with the ability to change out some bits and tools here and there, there are still too many tools that will never be used. And if planning to travel with a multi tool, it may be treated similarly as a hunting knife, survival knife, or pocket knife. This means it won’t be going with you to your destination and can easily be confiscated by security. A multi tool will be significantly less powerful than a full sized tool, but will still maintain good functionality depending on the setup. Knives on multi tools can be sharpened just like pocket, hunting and survival knives. Their edge over time is also considerable when size is taken into consideration, but that is probably due to less use. The whole idea of having a toolset in your pocket is a novel idea, but some constructions of the multi tool on the list are bulky to the point where they might lose their intended purpose for some users. The multi tool that fits on the keychain might be so flimsy that a user would be better served using a full sized tool. There is a risk reward when deciding whether to go with a more robust full sized multi tool or a smaller one that is more portable. Even with modding ability of a multi tool, once the user decides on which one they prefer, the only way to make a change in either the strength or portability of the multi tool is to purchase a completely different one. There are some huge tradeoffs when making a decision, which is a good reason why multi tools are mostly not expensive items. As long as the task isn’t too hard on the hands, multi tools are good for light to medium tasks. The handle will never be ergonomic enough to handle heavy tasks, and even medium tasks are pushing it depending on what tool is used. The comfort level when using these for long periods of time can be extremely stressful on the hands, as even the best multi tool on the market is not going to give the proper grip or resistance needed for it to be heavy duty. For the outdoorsman this is an indispensable tool to go along with their carry along knife, and cuts down on the take along clutter considerably. Warranties on most of these are not ironclad, so using a multi tool for a heavy duty job and breaking it is not going to automatically net a refund. A multi tool that is taken care of will last just as long as any other good tool, and knowing its limitations will go a long way in ensuring it serves its purpose. The rule is the lighter the multi tool the less power it has, with some minor exceptions. If resistance is on the harsher side when using a multi tool, then forcing it will only yield bad results for all parties. Even with the locking mechanisms and safety measures put into place, accidents can happen, so it is important to never force it to the point of breaking. Multi tools are a very overlooked and important set of carry along tools that has a place in anyone’s set. Besides being the most important portable tool a user can carry, they are also the most cost effective set of tools on the market for getting light to medium level tasks done. Several professionals use it and swear by it, and even when factoring in some of the issues with size, it is still a very good buy. Multi tools will only get better, and already have the ability to change out some unwanted tools with needed ones. With an expansion on that idea multi tools with proper care could be a must have item that even replaces some of the common tools in a set. As of now they are still making progress towards that direction, and users everywhere should look to the current companies for the best multi tool available to them.